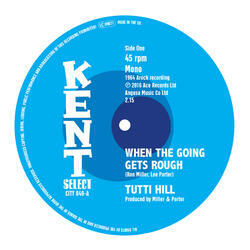 Tutti Hill's 'When The Going Gets Rough' was billed on the label of Arock 1012 in 1964 but the vinyl played 'Whoa Whoa, Baby Take It Slow'. At last this gorgeous mid-tempo dancer from Ron Miller and Lee Porter makes it to 45. The flip is probably the sparsest release ever on a Kent single, being a piano demo, but Garrett Saunders' magnificent baritone gives the song everything; it is such a pity he did not record more.